A few weeks ago, MacStories noted that Apple had told developers that a new Food & Drink category was coming to the App Store. “In the next few weeks”, applications will be automatically migrated to the new category; currently, the App Store doesn’t provide a specific category for these types of apps, which have been typically listed under Lifestyle by their developers. According to Apple, the new category will include “apps that help users cook and bake, mix drinks, manage recipes, find new restaurants and bars, and learn what their friends like to eat and drink”. 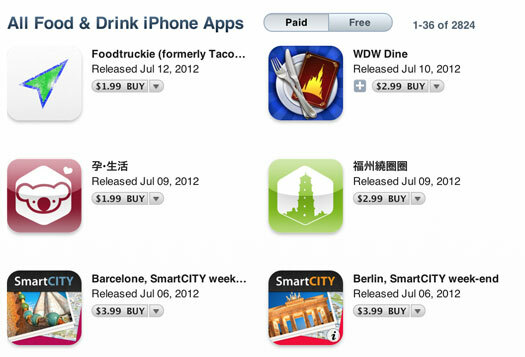 Food & Drink won’t include diet, grocery shopping, coupon clipping, or food-related game apps. The new category is now live in the App Store [Link] and features over 2800 Paid and 4000 Free apps in the iPhone section and over 1200 Paid and 1000 Free apps in the iPad section. Apple has been contacting developers with relevant Food & Drink apps over the past few weeks to prepare for the new category. Front page news? This is possibly less important than the bug fix to iPhoto. Chuck Norris owns neither microwave nor oven. When he is hungry, he simply shouts "BAKE" to his food, and out of fear, the food instantly catches on fire. iOS senses that and sends it to Apple servers and you (and your similar situated users) caused the feature to be added. If I'm an English speaking user using the North American store, why do I constantly have to see apps in Asian languages? It's one of the many many annoying traits of Apple's vaunted App Store. I, for one, have been losing sleep over this for months. This is EXCELLENT, life-alter news! A Food & Drink app using a Koala as a mascot makes me a little uneasy. I know this may shock you, but some people can actually read more than one language. So even if they primarily speak English, they may also enjoy media in Spanish, Chinese, Japanese, or French. Also, it has been found that many people who speak these additional languages live in the United States. Sociologists are still trying to determine what would cause this large diversity of people to seemingly melt together within a certain geographic area, but they are certain the answer lies in a middle school civics or history textbook. Create a third type of app category, separate from free and paid for. One where it's free to download and then costs money to actually either play further than a little bit, or is designed to cost money to progress through the game realistically. Some app devs have got out of control since the iPad app store started and are being really misleading about their apps. Totally abusing either the concept of "Free" or extremely abusing the concept of "in app purchases" to progress in a game. This is one of the worst creations/ideas in software I've seen since I started computing and Apple should stamp on it. Like buying a Radio at a store, thinking it's perfect then when you get it home, find out you can't get a refund and you need to pay more money to tune into more stations, or the tuning if really slow but you can have faster tuning if you pay a bit more. Either that, or allow us even just 1 hour to get a refund of apps that lie about their status on the app store and it's only after paying that you learn the truth.